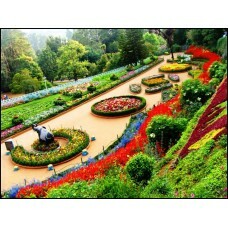 After breakfast visit Brindavan Garden - enjoy Musical Fountain in the evening. Night halt at Mysore. Morning after breakfast check out hotel & later proceed towards Coorg, En route visit Golden Temple at Byalekupe (Tibetian Monastery) and Nisargdhama. Arrive Madekeri and Check into Hotel. Evening visit, Omkareshwar temple and Raja Seat - Night halt at Coorg. After Breakfast Start for Local Coorg Sightseeing Visit Abbey Falls, Bagmandala, Tala Cauvery, Night halt at Coorg. Morning after breakfast Check out Hotel, later start for Ooty, same day Arrival, Check in Hotel, evening Visit Botanical Garden, Ooty lake, Night halt at Ooty. Morning after Breakfast, Start for Half day Coonoor Sightseeing, Visit-Wellington Military School, Dolphin Nose, Sim’s Park, Optional Enjoy Toy Train, Night halt at Ooty. After Breakfast Check out from Hotel and proceed towards Coimbatore station/airport for return journey. Tour ends with happy memories of the trip.